On April 18, we will gather together at 6:00 pm to share a meal. 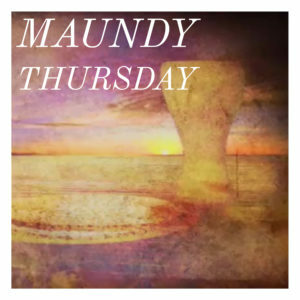 After the meal, at 7:00 pm, the adults and youth will move to the sanctuary for a Tenebrae service “A Service of Shadows.” Children in first grade through fourth grade will meet for a separate program in the Atrium. Childcare will be available for children in Kindergarten and younger. Please RSVP for dinner and childcare here. 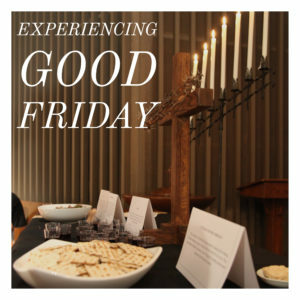 On Good Friday, April 19, from 5:30 pm to 7:30 pm, we will have guides for families and individuals to use as they walk through six stations that highlight stories from the last 48 hours of Jesus’ life. There will be a station with a Passover meal to taste, one for foot washing, a ﬁre pit with rooster sounds, a darkened room with the wood cross and nails and a hammer, and a room with bands of cloth and myrrh. We will have “guides” at each station for the ﬁrst hour. After the ﬁrst hour only the foot washing and ﬁre pit stations will have guides. Between the grief of Good Friday and the joy of Easter, there is a time of waiting. As we wait, we struggle to listen for God’s voice and to hold on to God’s promises. Join us for a Holy Saturday service where we will remind each other of these promises and listen together. The service will take place in the Atrium at 1:00 pm on Saturday, April 18. 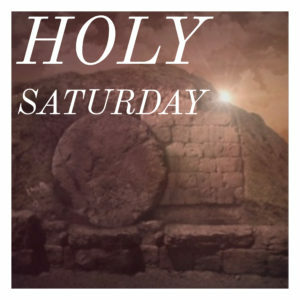 Following this service, all are invited to help prepare the church for Easter morning.